The Spain defender considers a domestic rival at Barcelona to be a better player than an illustrious World Cup winner. Lionel Messi (left) and Diego Maradona. SERGIO RAMOS HAS hit back at Diego Maradona by claiming Lionel Messi is the best Argentine player in history. Spain’s win moved them joint-top of Group B alongside Portugal with one game left to play in the group stage and Ramos was relaxed about their position. “They [Iran] went out to waste time, whereas we like to win in a different way,” he said. “We leave happy. We’ve taken another step forward and now we have to try to top our group, it’s our objective. Spain play Morocco in their final group game at the Kaliningrad Stadium on 25 June. 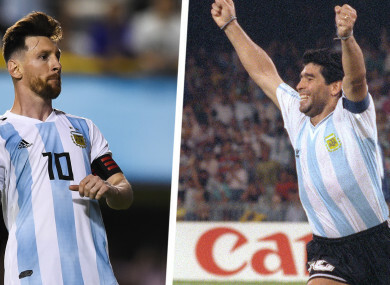 Email “'Maradona is light years behind Messi' - Sergio Ramos hits back at Argentina legend ”. Feedback on “'Maradona is light years behind Messi' - Sergio Ramos hits back at Argentina legend ”.